Henry Bolingbroke is King. His son, Prince Hal, spends his time drinking and carousing with low companions like his closest friend, Sir John Falstaff. A group of rebels—Henry Percy (“Hotspur”), the Earl of Northumberland, the Earl of Worcester, the Scottish Earl of Douglas, and the Welshman Owen Glendower—rise up against the king. At Shrewsbury, Hotspur leads a vicious attack, though he and the rebels are outnumbered. The Prince makes up with his father and is given high command. He defeats Hotspur, redeeming himself from his former dissolution and proving himself a great warrior and future king. 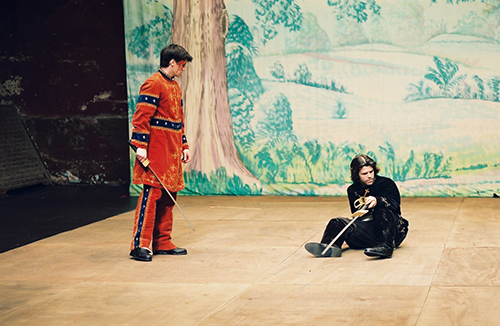 In an act of kingly mercy, Hal releases his prisoner, the valiant Earl of Douglas, without ransom. But the war is not over; Northumberland, Mortimer, and Glendower join with the Archbishop of York and continue their rebellion. A co-production of Brooklyn Academy of Music’s Next Wave Festival, BITE:03 Barbican and the Hebbel Theater.